Requirements for Logos, Text Designs and Graphics Patterns are commonly used in Jewellery and Industries for which Laser Maker is a common tool which is indispensable in such Industries. The new generation Aczet CFC Series has solution with 50/70 W output power which enables to get the job done with quality and reduces working time. The machine is capable to cutting metal sheet upto 1.00 mm of thickness. Technology CFC Series is based on high performance Ytterbium Pulsed Fiber Laser with high frequency scanner head, offers productive performance, capable of getting most incensed work without compromising quality and precision with quality standards. Features of this new CFC Series: Powerful enough to cut up to 1-mm thick metal and few precious metal plates. Auto head : Standard automatic head moves ups & downs with auto controls makes samples positioning user friendly. Operating commands can be viewed and executed using the software. The possibility to import images, models, logos, texts etc., from a broad range of files with different extensions. The New CFC Series could also be fitted with a rotary axis device, to facilitate LASER-marking of curved surfaces, such as the inside or outside of ring, bangels or bracelets. Software Controlled Rotary : CFC Series can be provided with a rotary device with automatic movement, controlled by software. A tool necessary for LASER-marking rings, bangels, bracelets and all round or curved objects. Supports for Rings and Bracelets (Optional Device) : Especially designed to be firmly applied to the rotary axis device, these three-pin chucks are perfect for LASER-marking the inner or the outer side of rings, bangels, bracelets and items with a round shape. 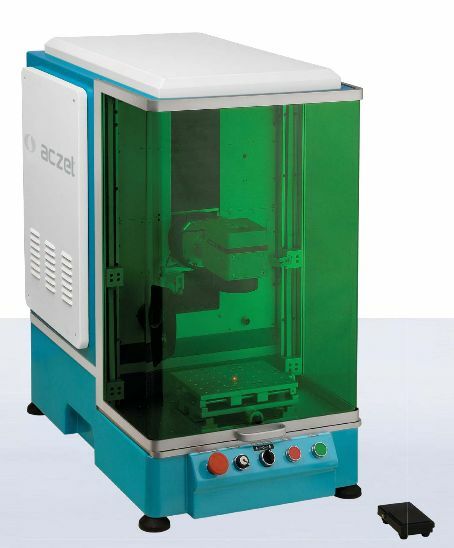 Automatic zig for Plate Cutting (Optional Device) : The automatic zig for metal plates provided by CFC Series makes it possible to mark and cut objects from a metal samples without bending. Control through Foot Pedal : Once the job or the design pattern is ready and the required parameters are set foot pedal will do the job for you. Same job can be repeated several times without touching the application software. Dust Collector : Vaccum chamber designed in connection with dust collector allows to recover the dust inside chamber.